using an HP Deskjet 9600 color printer. COLORHUE Silk Dyes were from Things Japanese. 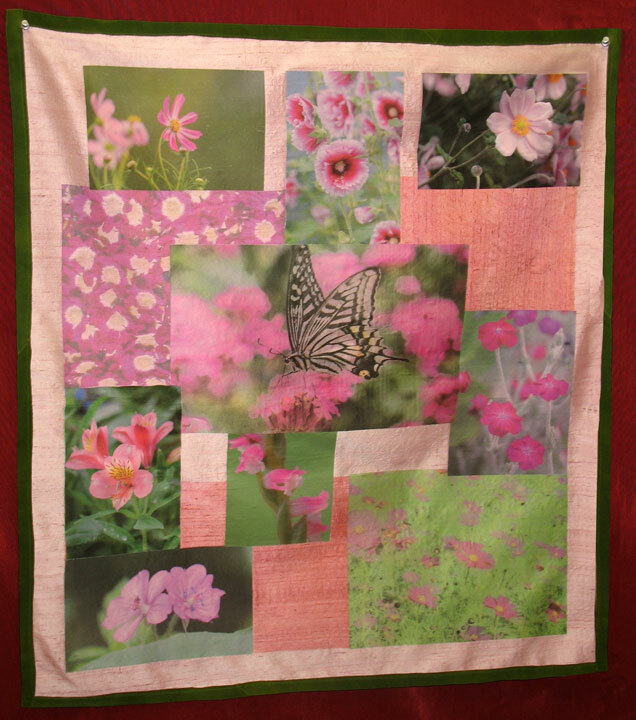 To construct this wall hanging, non-registered piece layering (overlaying silk layers onto a ground fabric) was used. The silk fabric pieces were attached to the ground fabric with Steam-A-Seam 2 Lite (double sided fusible for silk). The ground fabric is a Silk Flat Crepe hand dyed with COLORHUE dyes. The other layers are Silk Satin and Silk Chiffon (inkjet printable fabric sheets). Other projects and collaborations featuring images from Hirata-san are in the works. Check back for more information. Thank you to the Warm Company for the Steam-A-Seam 2 Lite which was instrumental to this project.